Georges St-Pierre, a two-time welterweight champion, return to MMA after a four-year of hiatus last November and claim the UFC middleweight title at UFC 217 after defeating Michael Bisping via technical submission in the third round. That victory made him the fourth two-class champ in company history. GSP relinquished the belt soon following, citing a medical concerns colitis which is going to keep him on the sidelines longer period of time. It’s a question long debated throughout the history of the earth: Who is the greatest fighter of all time in MMA? The first name comes in mind is Georges St-Pierre, another title St-Pierre cemented in the octagon on November 4 does that make him GOAT? According to his coach, Firas Zahabi, there’s no question. Georges St-Pierre flaunts a professional record of 26-2. His two losses came to Matts Hughes and Serra. He’s No. 1, no doubt about it,” said Zahabi in an interview with Fight Hub TV (Quotes Via MMA Fighting). “Who else could there be? Give me a name. “Conor [McGregor] hasn’t defended a title. [Fedor] had too many losses. [Anderson] had too many losses and you know what happened. The testing didn’t go well. [Jon] – testing. There’s nobody else! There’s nobody else. I’m not just saying that because I train him. Put me aside, the guy is the greatest martial artist of all-time. That’s it. He did it. Let’s give him his due props. He worked for it, he deserves it. If another name comes along that does more than what he did, I’ll be happy to say that there’s a new best of all time. Don’t forget that St-Pierre is one of the UFC’s Biggest Box Office draws and a two-division world champion. Do banned substance steroids matter? Should they affect a fighter’s legacy? Anderson Silva and Fedor Emelianenko have some losses under their umbrella which has dropped their stock, in terms of GOAT status. Prior to ‘Jon Bones Jones’ issues with USADA, particularly his second USADA positive drug test, the former light-heavyweight champ was count under the GOAT status. According to coach Zahabi, there is another fighter a UFC flyweight champion Demetrious Johnson, who holds the record for most consecutive title defenses can surpass the GSP as Greatest fighter of all time. Regardless of what Zahabi says, ‘The Mighty Mouse’ hasn’t faced biggest names mentioned above inside the Octagon. “Demetrious Johnson is No. 2 in my opinion,” said Zahabi. “Absolutely. The only reason I wouldn’t give it to Demetrious – and I think the world of Demetrious, I can’t say enough good things about him – he didn’t have the hornets nest, the challengers that Georges had. He just didn’t have those legendary guys that went on a win streak, that were unstoppable, and then were stopped by the champ. He didn’t have that. And it’s not his fault. It’s not his fault at all. He took down everybody they put in front of him and he did it in style; however, he never had that guy. 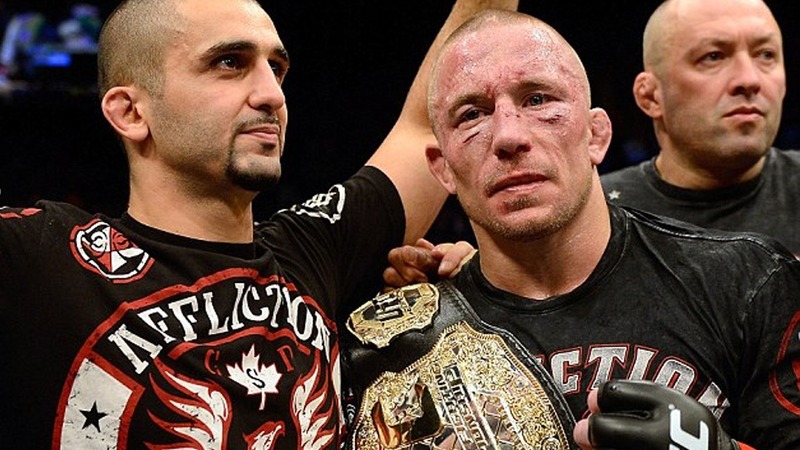 Do you agree with coach Frias Zahabi saying about Georges St-Pierre is the greatest MMA fighter that ever lived?